Donna and I spent most of the first of our three days at CES 2015 at Central Hall. Fresh from last night’s keynote by Samsung CEO BK Yoon, where he announced that in 5 years 100% of Samsung devices will be Internet of Things (IoT) devices, we first headed to the Samsung exhibit at Central Hall. If my memory serves me correctly, while the new Samsung TV’s were as flashy as ever, the exhibit didn’t have the overall grandeur of past Samsung displays, such as the massive sculptural arrangements of dozens upon dozens of LED TVs at 2010 CES. 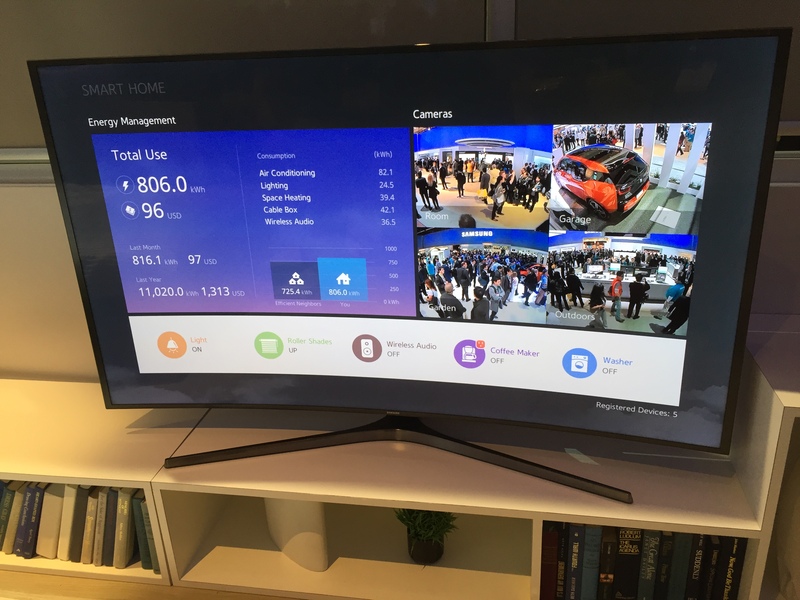 However, true to CEO Yoon’s promise that Samsung was 100% onboard to the Internet of Things, newly acquired SmartThings was given a prominent position in the Samsung exhibit. The “Infinite Possibilities of IoT” was reflected, for now, in the finite number of SmartThings devices (hub, sensors, outlets) and the finite but growing number of firms producing products that work with the SmartThings system. Presumably, the “infinite” possibilities of the IoT will come from the ways these devices will be combined with each other, once they are in the hands of consumers. For now, Samsung and SmartThings chose to highlight four fairly basic scenarios of Samsung’s IoT devices – the living room, kitchen, bedroom and garage – designed to create peace of mind, energy savings, convenience, and a “welcome home” feeling. These scenarios were pretty specific and in some cases involved technology that is currently out of reach of today’s consumers, such as “voice command your car to pull out of the garage.” Unfortunately, a self-driving car isn’t one of the current Samsung SmartThings modules, so I guess we’ll have to wait for that. 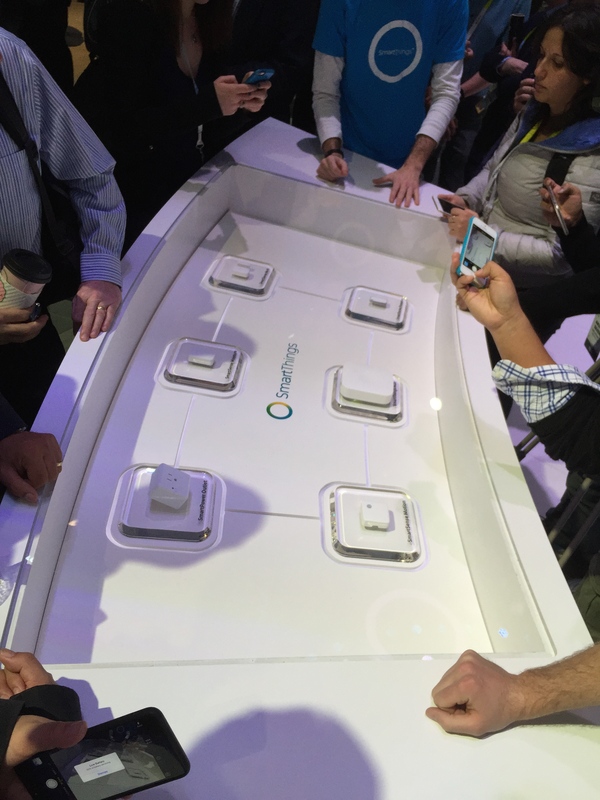 At CES 2014, I don’t recall Samsung saying much, if anything, about the Internet of Things. 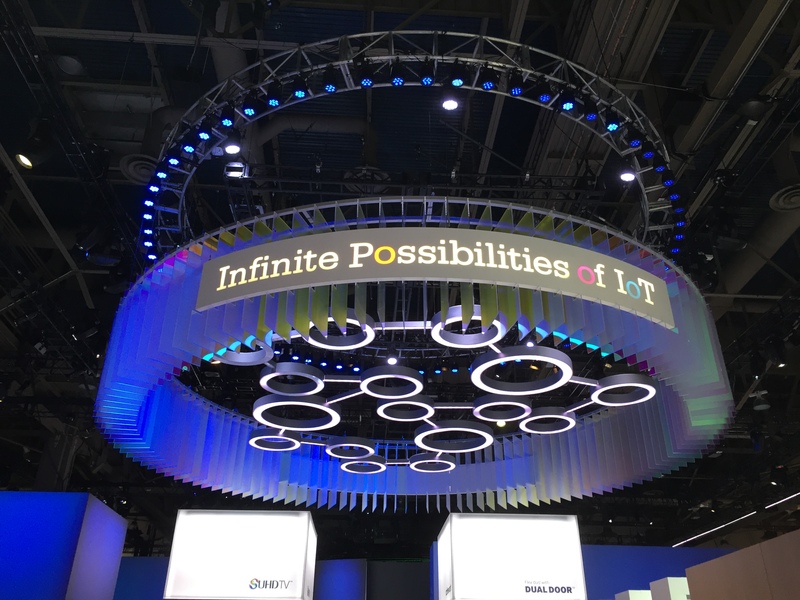 A year later, with the acquisition of SmartThings, IoT was at the heart of Samsung’s CES message. I was surprised to see Samsung so heavily promoting it’s investment in IoT at CES – what a difference a year (and a good acquisition) makes! The vast majority of the smart home and IoT activity this year is happening at the “Tech West” in the Sands (which I’ll visit tomorrow). Given CEO Yoon’s keynote statement that “IoT needs open standards and universal inclusion to be a game changer for society,” it’s a bit to confusing to find Samsung’s IoT presence was at Tech East, while most everyone else was present at Tech West. Does that mean anything? Although I found plenty of interesting IoT parts at the Samsung exhibit, and good examples of how these parts can be combined into specific use cases, still lacking was a clear sense of what the smart home as a whole was going to be like. We all know the whole is going to be more than the sum of the parts. The problem is people seem focused on the parts, instead of what it is all going to mean. One place where it started to come together a bit was a prototype of what a smart home TV-based dashboard might look for the new SmartThings hub coming out later this year. The Samsung rep couldn’t provide specifics on the dashboard, but this is a place where things do start to come together. Still, it’s not clear how all of this will change the relationship people have with their homes, or the experience of what one’s home is. Maybe that will become clearer tomorrow at Tech West.